Old I-88 shields still stand in proliferation on both sides of the freeway. 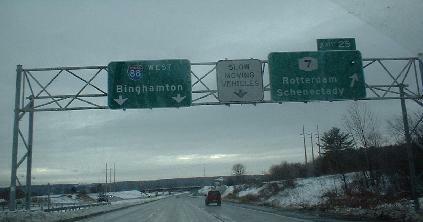 I-88 was built up alongside NY 7 from Albany to Binghamton, and at its conception before the advent of the Interstate Highway System was intended to in fact be NY 7. Interesting tidbit: Due to added capacity from I-88 heading toward I-90 and I-87 on the other side of Albany, the New York Thruway (I-90) built an extra lane between I-88 and the I-87 junction, and does not toll traffic moving between the two. All photos are taken westbound except the shield below. The first BGS that greets you traveling WB, and the END 88 shield across from it on the EB side. 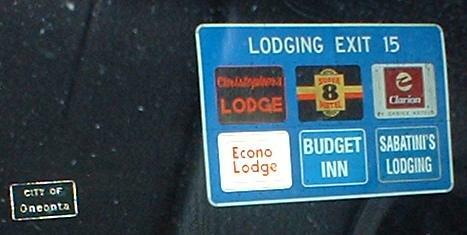 The little Oneonta sign is one of two button-copy signs heading WB between the beginning and Exit 5; the other is a BGS before Exit 17. There are none heading EB. Beautiful fall scenery nearing Binghamton. 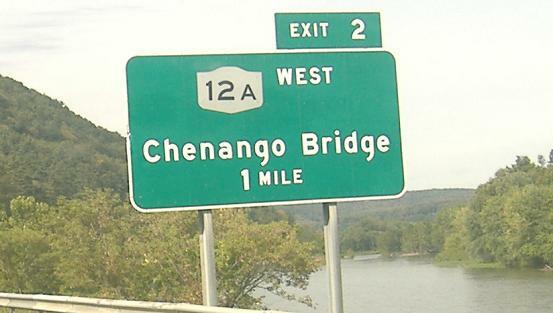 Still WB and joining the Chenango River, first photo courtesy Doug Kerr. 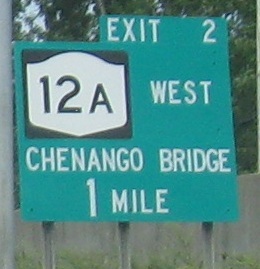 West of Exit 4, NY 7 is on I-88. 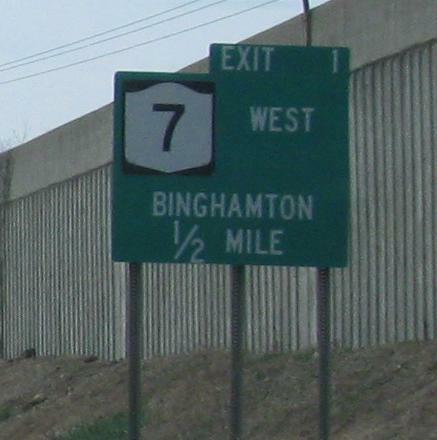 Although NY 7B runs on old 7 until Exit 3, the connection is a little awkward so NY 7 doesn't try it out. 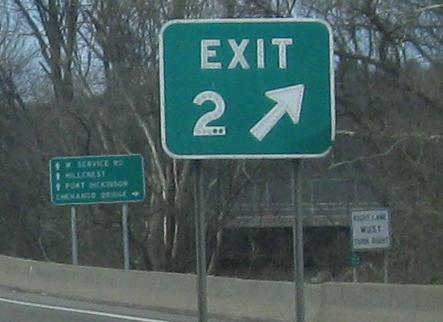 West of Exit 3, there is not enough room to fit both I-88 and NY 7 together. Of course, there is no room for any buildings either, so there's no need for a surface road. Notice that this was originally built as an expressway section of NY 7 - you can tell from the little 7 in the green signs along the way. 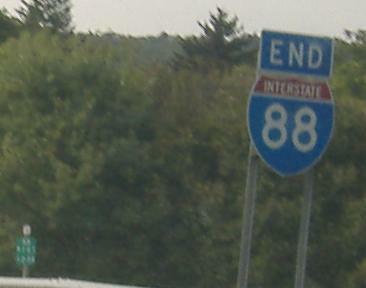 Three of the last BGS's you see on I-88 WB, and the last one, with a button-copy gore sign mixed in. The first BGS are courtesy Doug Kerr. Notice that two of them are for NY 7; most of the exits on I-88 are marked for NY 7 in some form (BGS or standalone shield), just as, say, I-95 and US 1 through CT. 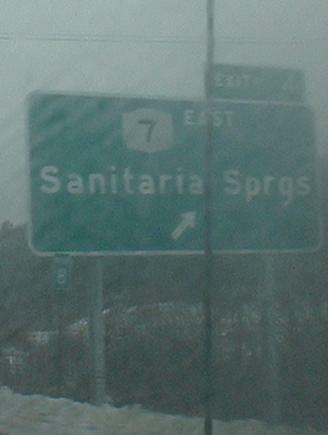 In fact, NY 7 and I-88 multiplex between Exits 1 and 4, which includes three of the signs above and the two eastbound signs below. NY 7B runs on old NY 7 between Exits 3 and 4, but no mention anywhere because it's relatively new - but is it really newer than the signs? And couldn't it be applied retroactively? 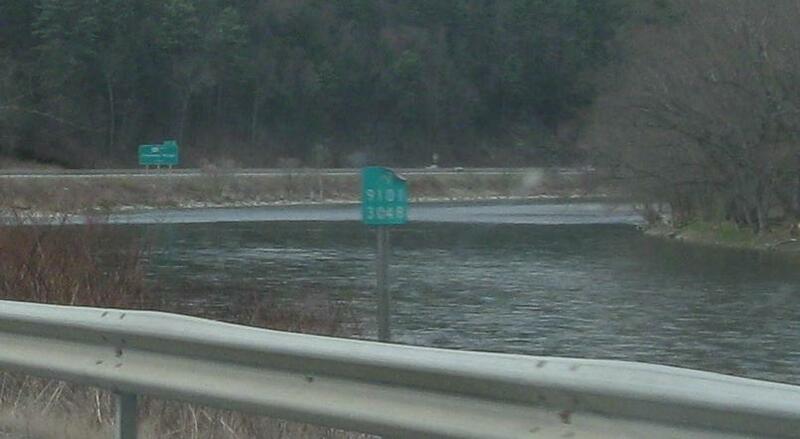 I guess the WB 1/2-mile advance sign was knocked down. I find this replacement vastly more interesting. Then again, it also happened in the eastbound direction. If this was a casualty of construction, it's several years overdue for a permanent replacement. 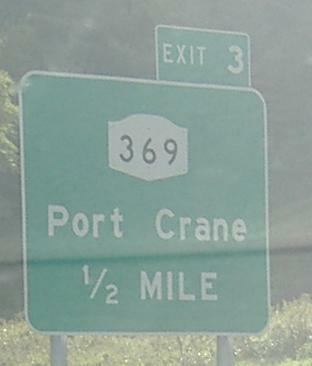 Eastbound, button copy and a sign needing font help.